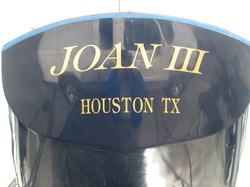 A shiny stern with a new name Joan III (this is Joan I) on our Alberg 37 a Carl Alberg designed 37 foot long keel yawl. This picture is taken on the yard. The blue masking tape for the varnish work is still on. Look for pictures and comments on survey, acquisition, before the restauration, during the project, and after. Immediately after the transfer of ownership we have brought the Joan III to the yard. 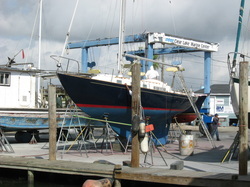 Ben Miller Boatworks started working on a longish list of refurbishments.